I've been missing my friends back home lately. I was doing fine with the distance but then the question "are you coming home for Christmas?" became the point of conversation and it got me thinking of how badly I do want to see everyone. Joe and I won't be back in LA until February and though I think that it will be great to see everyone outside of the holiday madness, I will miss out on some key people who will be home in December only. I have made some friends here (thank you blogoshpere and friends-of-friends!) but it has been an interesting experience to actually have to think about making friends as an adult. 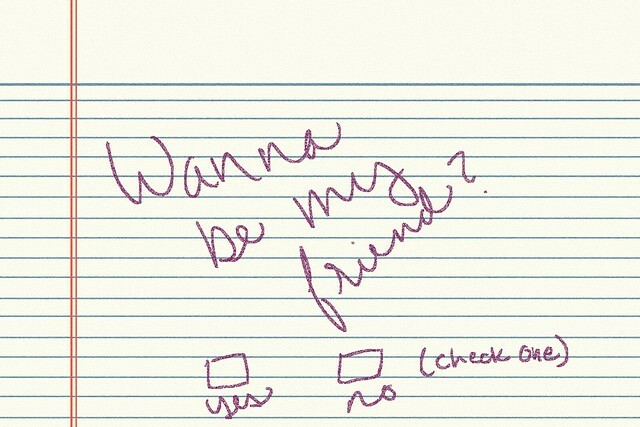 It's not as simple as it was back in first grade when you solidified a relationship via a "yes" or "no" check-box. I'm not working in an office with people who might share my interests and I'm not in school where you are crammed in with other students who you are bound to make friends with. It wasn't until I moved here that I realized how easy (and thoughtless) making friends had always been given that I was always in either of the above mentioned environments. Now that I'm pursuing ventures of my own, I'm not likely to meet people throughout the day so I'm learning to make little efforts like going to events, workshops and tagging along with friends and their friends. Actually, one of my friends from a previous job recently moved to London to do her Masters and I'm so happy that she's here! She and an American couple are hosting a Thanksgiving dinner on Thursday and are inviting all of their friends. I'm totally geeky excited to see some new faces and socialize over a good meal. I'm perfectly happy to do my own thing, and Joe truly is my bestest friend in the whole wide world, but sometimes it's nice to share experiences with other people too. Have any of you experienced this whole making new friends thing?